A group exhibition titled Be Smart About Art is going on at the Athena Gallery of Fine Arts in the city’s Progoti Sarani area now. The exhibition was inaugurated by Ambassador Farooq Sobhan as the chief guest. 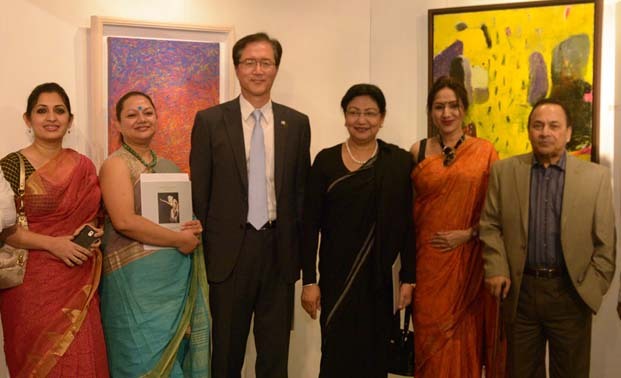 Eminent artist Kalidash Kormokar was also present as guest of honour at the inauguration. Curator of the gallery Zeenat Ikramullah, participating artists, among others, were also present on the occasion. The exhibition is highlighting the artworks of eight young accomplished artists showcasing Bangladeshi contemporary art. Be Smart About Art filters the contemporary world through the perspective of the new generation. It offers reflections on the rise of the middle class, the political changes sweeping across the globe and the economic growth that have radically altered society’s anxieties and aspirations. The participating artists have travelled abroad and exhibited internationally and bring the sensibilities of globalisation to their work. The featured artists are: Anisuzzaman, Ashim Halder Sagor, Ashraful Hasan, Bipasha Hayat, Bishwajit Goswami, Maksuda Iqbal Nipa, Nazia Andaleeb Preema and Pijush Kanti Sarkar.